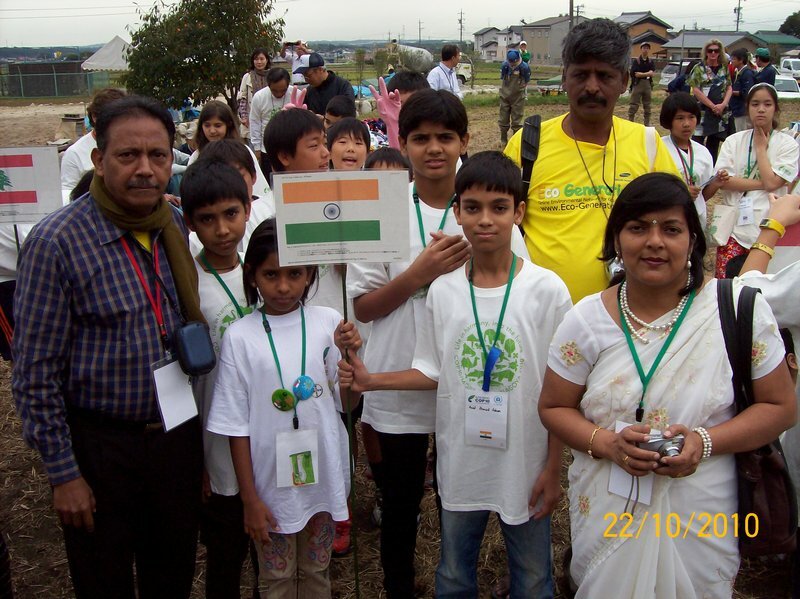 Nagoya, Japan Oct 26, 2010:Three Tarumitra students from Patna along with teacher, Mr. P.C Thomas from Don Bosco Academy attended the 10th Children’s Conference on Biodiversity in Nagoya Japan 20-27 Oct.
U.N officials selected the three students, Asad Adnan, Shubhangi Singh and Sushmit Mondal based on the projects they sent on bio-diversity. The team had a tough time since the students could not get neither their passports nor the visas in time. Special mention must be made of the Herculean effort put in by Sushmit’s Dad, Mr. Mondal to get everything settled and get the kids to Delhi Airport in time. All the parents lived on pins and needles till the last moment. Joyce Sang from the UNEP must be thanked for readjusting the tickets to suit the belated visas. Tarumitra’s Yugratna (14) who addressed the U.N General Assembly in 2009 gave leadership in the conference as a Junior Board Member. She addressed the whole gathering on Bio-diversity on the second day. 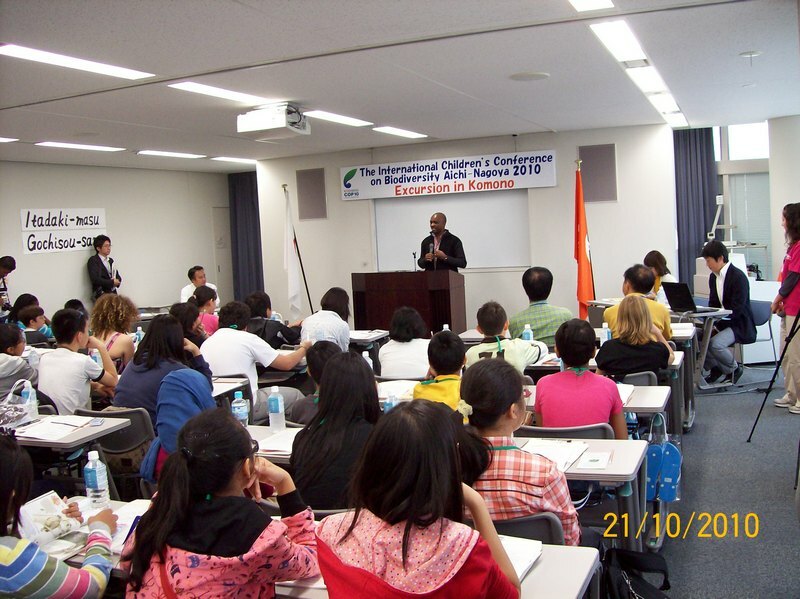 The conference began with an opening ceremony organised in Nagoya included speeches from President of Aichi and UNEP Official, Mr.Theodore Oben, who stressed upon carrying out actions for preservation of Bio-diversity. Thereafter, the participants embarked on a field trip to the biodiversity-rich Komono Town where they had a very informative talk about the abundance of the Akaya forests, especially that it provides drinking water to Tokyo City. This was followed by a tree planting ceremony at the camp where each participant planted a sapling with a message on a wooden board. 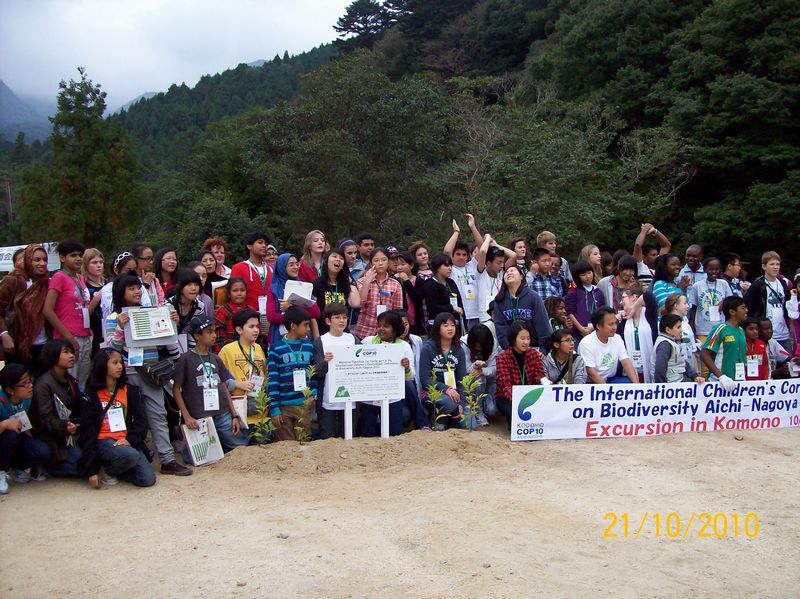 Thereafter, participants were treated to the Satoyama Experience where they leant about the various Japanese species of trees in forests. They also did some fishing in a stream as well as catching of insects and frogs in Paddy fields! 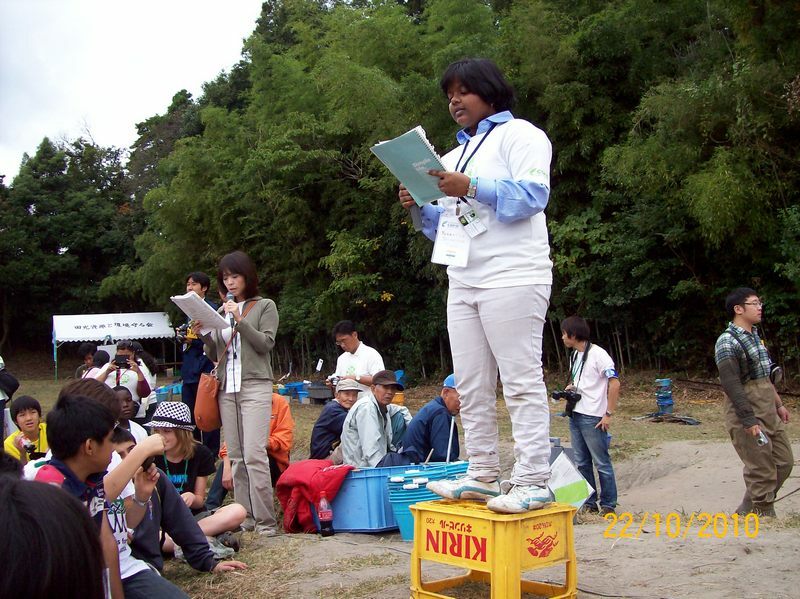 Specialists taught them to distinguish native and invasive species of fishes. Students were also briefed about small micro generation of electricity and the irrigation from mountain ater. They wached the production of charcoal from firewood. On the last day while some of the delegates and chaperones went on a tour of Mount Fuji, the rest of the children visited the Midorigaoka Primary School, the Toyota Assembly Plant and the Nagoya City Museum around Nagoya. While visiting the Toyota Car factory and museum, the students were greeted the Assembly line by a fully functioning robot that play a tune on the trumpet for them. The participants were then given a guided tour of the motor car assembly line and visited the Toyota Museum, where they witnessed some of Toyota’s latest models and sports cars such as the Lexus Sports car, LFA. All of the participants received a toy replica of the Toyota Prius as a memento of their visit. The team returned to India with “after an immense experience of the global student community” as described by Asad Adnan. This entry was posted in Tarumitra and tagged Asad Adnan, Nagoya, PC Thomas, Plantation, Shubhangi Singh, Sushmit Mondal, Tarumitra, Theodore Oben, Tunza on November 13, 2010 by tarumitra.